`mixed-in-place` is a specialist term for the so called – construction mixing method. It signifies the production of foundations concrete building and lean concrete building or hydraulic fixed base courses, also described as soil stabilization (with cement or whitewash). Soil stabilization with hydraulic binders are methods of construction with tradition. The methods were already practised by Romans to improve the load-bearing capacity of the grounds an the road construction. Because of the long term – experiences they belong to the well-developed methods of construction of the earthwork and road construction. 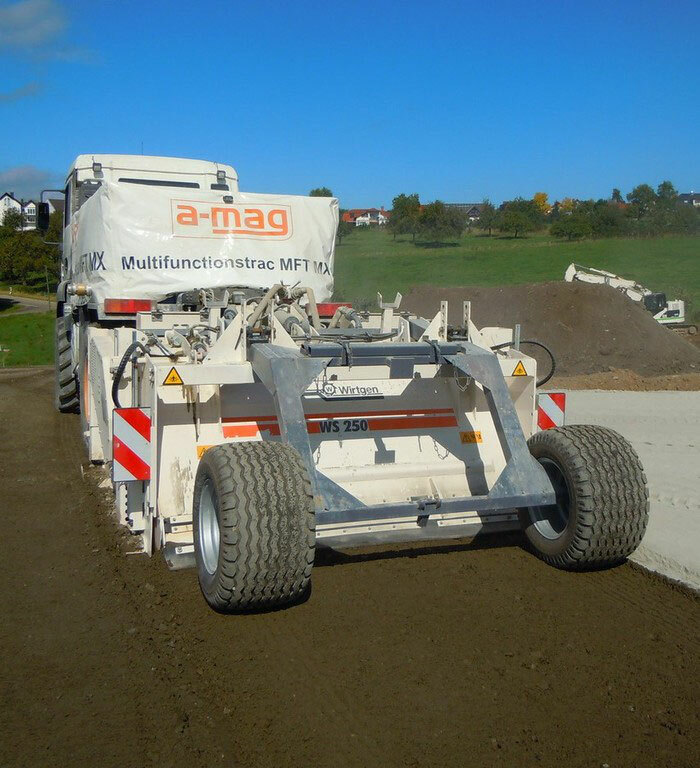 Through this method the working life of the road surface or areas constructed for traffic increases considerably – in most cases around the factor 1,5 up to the double working life. As a voting member in the panel of experts soil stabilization and soil improvement of the German Road an Traffic Research Association we were involved in the preparation and establishing of laws, standards, guidelines and explanatory leaflets which are used by the road commissions. The standardised `mixed-in-place` method finds use in road construction, airfield construction, an areas constructed for traffic construction in general. The processing ground needs sufficient humidity which is perfecly adjustable with the water car ´aqua-mat`. Cement or whitewash are outraged exactly on the ground with our `conti-spreader` - appropriate to the guideline from the aptitude test. 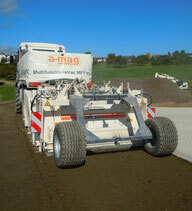 The `conra-mixer` homogenizes the ground to a regular mixture and produces a regular planed subgrade of lean concreate. Special trowel up – planks, levelling equipment and closing high compaction planks reach exact levelling. The compaction of the solidification occurs with a vibrating roller with appropriate determined amplitude. Finally a pneumatic tired roller subsides the area through static compression. A hardened area should be damp for at least 3 days after the production or hosed of with a bitumen emulsion. In addition the carving of the solidification occurs after the requirements or in dependence of the envisaged superstructure to prevent reflection cracks.